Many clients have asked us over the years for advice about connecting with a loved one who has dementia. In this video, Tim Tholen, CEO and Founder of Thoughtful Health Care and its affiliates in Kansas City, talks about how to maintain a relationship with a loved one who has been diagnosed with dementia. We all know that nothing lasts forever, even the current stage of your loved one’s dementia. When you can to listen to happy stories, or reminisce about times past, you are connecting with a part of the loved one that is still present. Go with it. Strive to soothe, not ruffle feathers. When you see visual or verbal cues of irritability, back off, or change the activity. The sounds of the past—favorite family tunes or songs from an era gone by– can ease stress by taking the focus off of the struggle to remember. Family recipes are also a great way to connect with a loved one. Aunt Suzy’s molasses cookies might begin a conversation about summers at the lake, for example. You might be surprised what memories arise when your loved one is given a wooden spoon of batter to taste. Call us at Kansas City Home Care for support and help with your loved one. 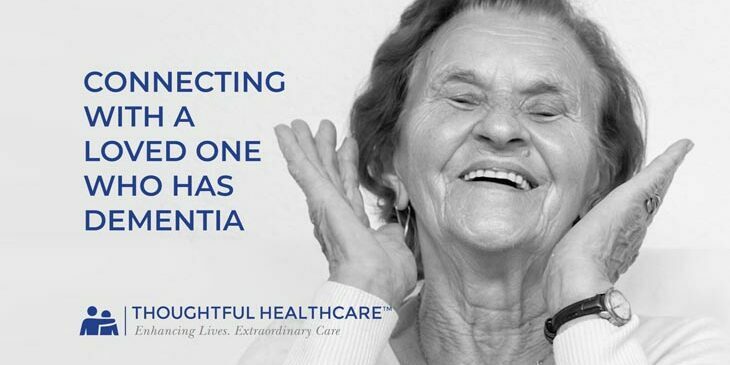 Our expert caregivers are here to help you. Watch the “Connecting with a Loved One Who Has Dementia” video below.